Thanks to her tireless campaigning, in 1999 the Labour government held a judicial inquiry into the circumstances of Stephen's death. The judge Sir William MacPherson, who chaired the inquiry, found that the Metropolitan Police Force was "institutionally racist" and that this was a cause in the failure to solve the case. Finally, in 2012, Gary Dobson and David Norris were convicted for Stephen's murder. "I never thought it would happen," said Baroness Lawrence, close to tears as she addressed the festival audience. "I still get really emotional about it." Baroness Lawrence, who was made a peer last year, now sits on various committees to improve community relations with the police. On one such committee she mentioned her encounter at London Bridge to a senior police officer. The arresting officer was tracked down and Baroness Lawrence was asked what she would like done, but she decided to leave the matter as it was. "It was enough that he knew." Though there have been calls for Baroness Lawrence to stand for Mayor of London, for the time being she is content to work in the House of Lords and to run the Stephen Lawrence Charitable Trust in honour of her son's memory. While speaking about her experiences in the upper house, she also revealed that she has been regularly snubbed by Sir Paul Condon, the former Commissioner of the Metropolitan Police and also a Lord. Baroness Lawrence told the audience that 99% of the House of Lords members were friendly, knew her name and often said hello. "He walks past me with a blank face." Faced with Baroness Lawrence's serenity and quiet determination, you feel confident that such snubs would have little impact. Although she has not personally experienced racism, she said, "I've got a voice and I try to use it as best I can." The baroness is also determined that the rest of us should join her in the fight. Reflecting on the incident in London Bridge, she said, "Where you can [while being aware of your personal safety], you need to challenge these things because these things happen all the time." The Stephen Lawrence Charitable Trust aims to help young people transform their lives and careers by overcoming disadvantage and discrimination. 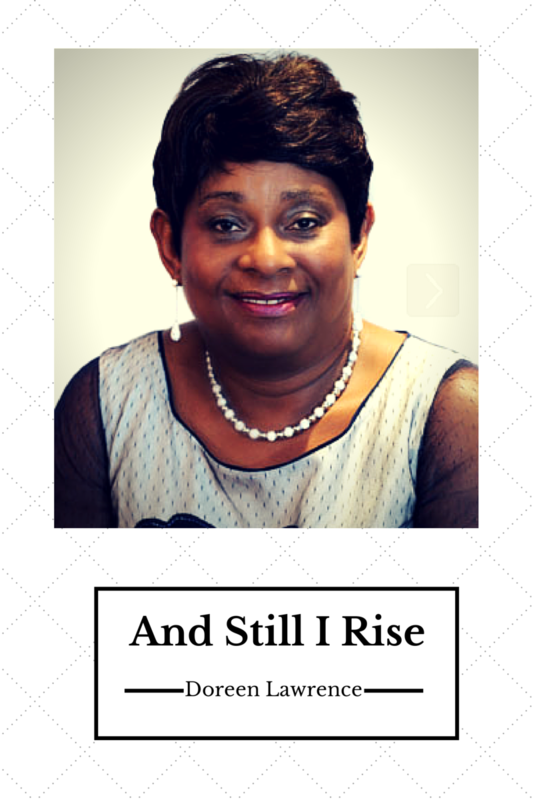 Baroness Lawrence has written a book about her search for justice: And Still I Rise. A passionate and political memoir by an anti-apartheid campaigner in the lead-up to the 1964 Rivonia Trial. Hilda Bernstein's husband, Rusty, was acquitted but many of his co-defendants, including Nelson Mandela, received life sentences.